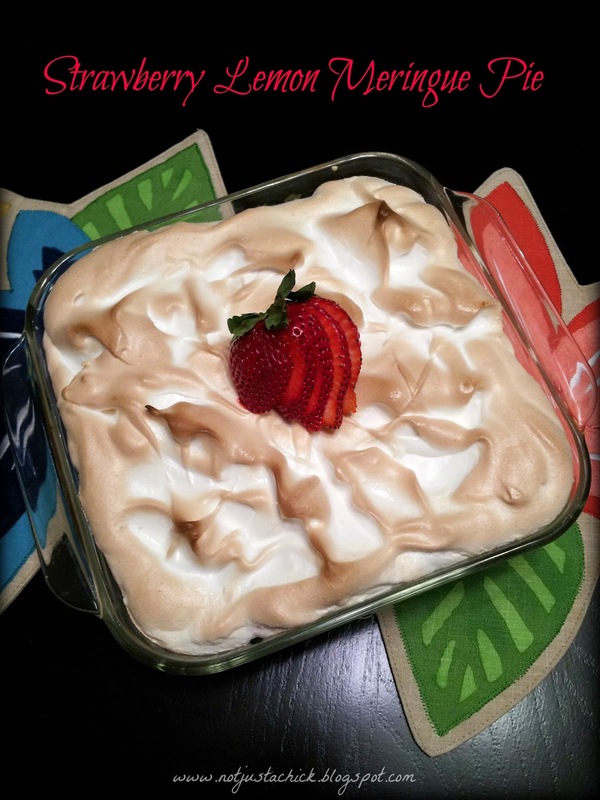 Not Just A Chick: Strawberry Lemon Meringue Pie... A great kick off to Summer! 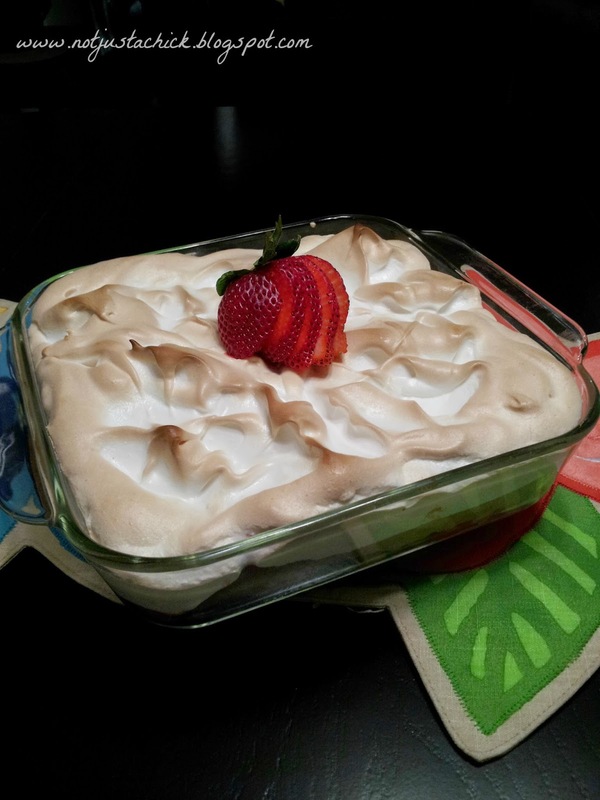 Strawberry Lemon Meringue Pie... A great kick off to Summer! Strawberries.. Wine.. A warm Summer Night.. Cozy Patio. *sigh* (Is it bad I have Deanna Carter’s “Strawberry Wine” running through my head as I typed that sentence?!) I love this time of year. Not too hot, but after the day is done you come inside feeling just a lil’ sunkissed. It’s amazing how motivating good weather is! How much one can get done when the music is playing.. windows open.. and sun is shining in. I even remembered to water my plants on my patio! Which leads me back to Strawberries. SO FAR this spring/summer.. I have had 2 small success in the “green thumb” column. Basil/Herb planter AND now my Hanging basket of Strawberries! 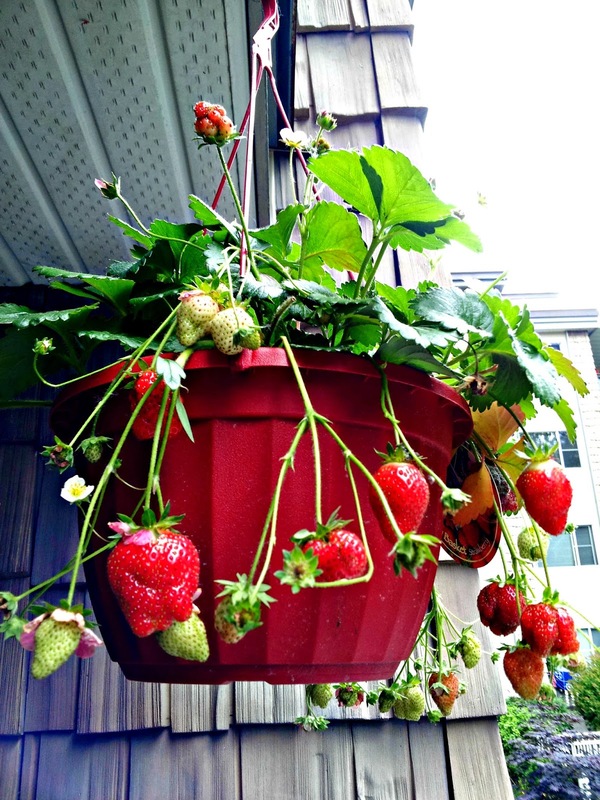 The berries are ripening up perfectly…as in more than one, basket is heavy with the young berries!! YIPPEE! Enter food craving. Anything Strawberry. Being how there was an upcoming Birthday Celebration at the office… I thought that I’d forgo the traditional Birthday cake.. and go with this. Strawberry Lemon Meringue Pie. Things that I am learning: Life is weird. Timing is everything. A good healthy life takes effort. Sometimes… the best thing you can do after a long day, is pour yourself a glass of wine, get into some comfy clothes, and go ahead and make that new recipe. BBQ up that yummy steak you bought, and were saving in case you were cooking for a crowd…heck – you’ll have lunch tomorrow…. But most importantly learn how to just live, and feel blessed for what you DO have in life. Be Happy. Go for that extra kilometer on that run you really didn't “feel like” doing. Don’t worry if you don’t have the entire day planned out. Sometimes the best days are the last minute plans… or the even better ones are ones where you didn't even get fully dressed for the day and just went with what felt right. Maybe that’s why I’m going to focus on bringing this lil’ blog adventure of mine back to life. I ENJOY it. I like hearing how people have tried out the recipes.. I enjoy sitting back, firing up the lap top and sharing. 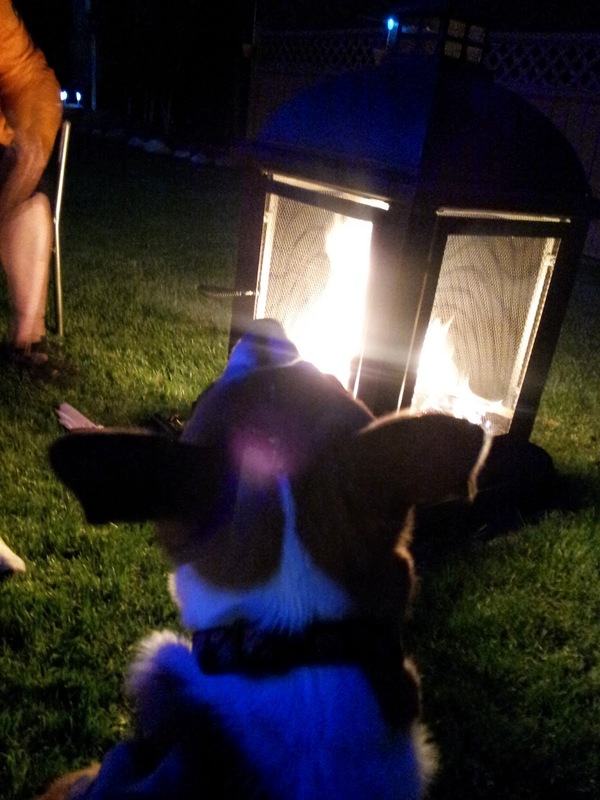 Friday night was a perfect example of the above… last minute invite to friends BBQ turned into Kenzie experiencing her first “camp fire”.. backyard or not…great friends, awesome dinner and topped off with us sitting around a fire. It was the perfect summer night. Ahhh.. back to the Strawberries. Which are everywhere this time of year… and good thing too. 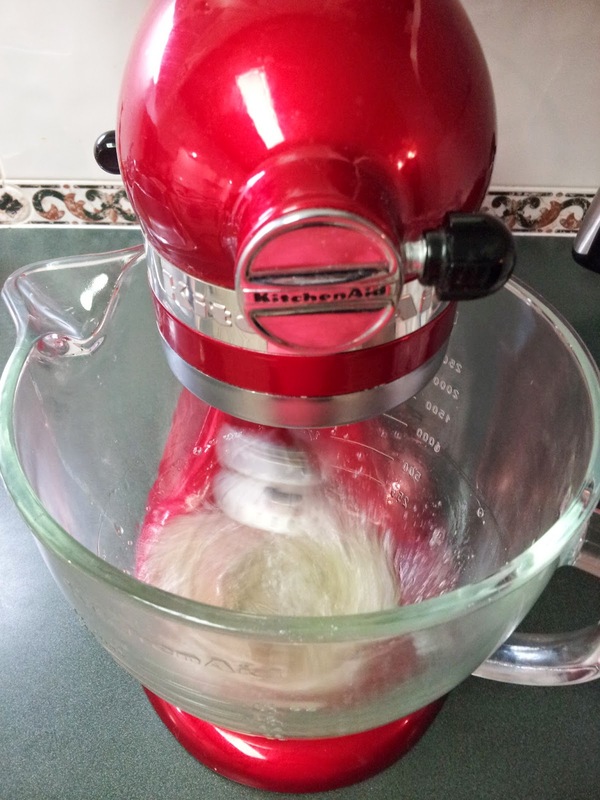 I’m just getting started on all the yummy things you can do with them. 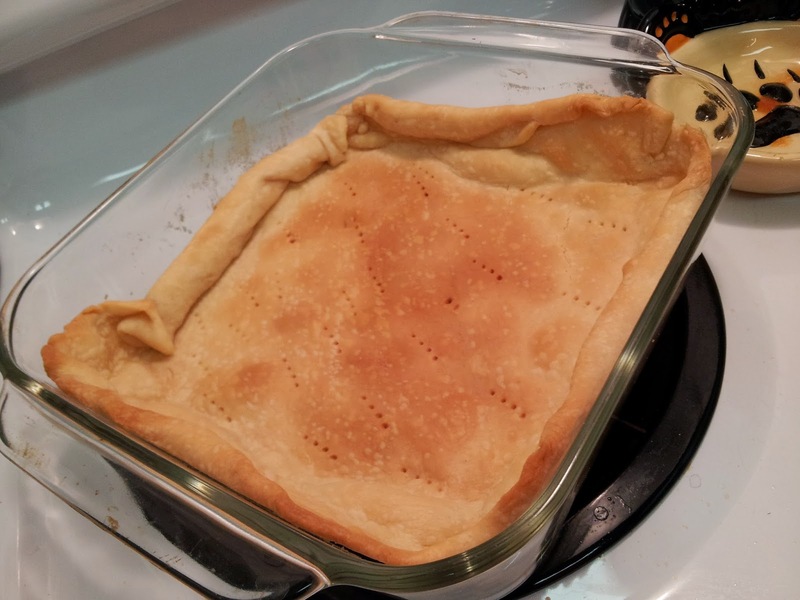 - Place Pie Crust in pie plate (this time I used a square glass pan, as for some reason... my pie plate is ummm..gone.) Prick with forth. Baked until Golden. - Remove from oven, let cool. 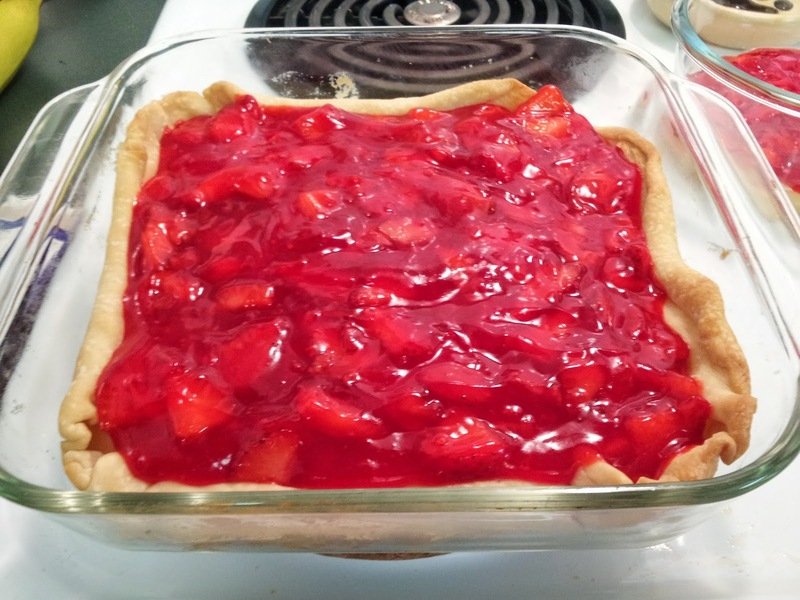 - Place pie in fridge while you work on the strawberry filling. 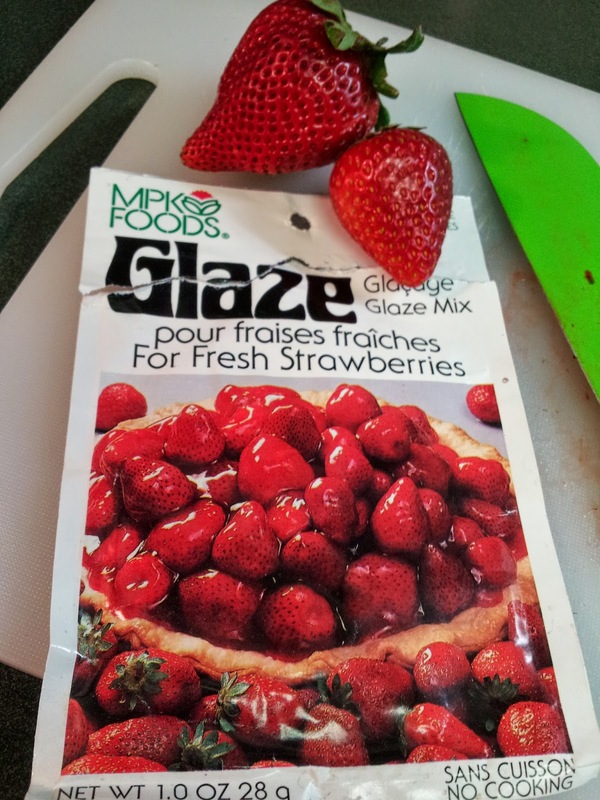 - Whisk up glaze according to package directions, I used this glaze below, but any fruit glaze would work. 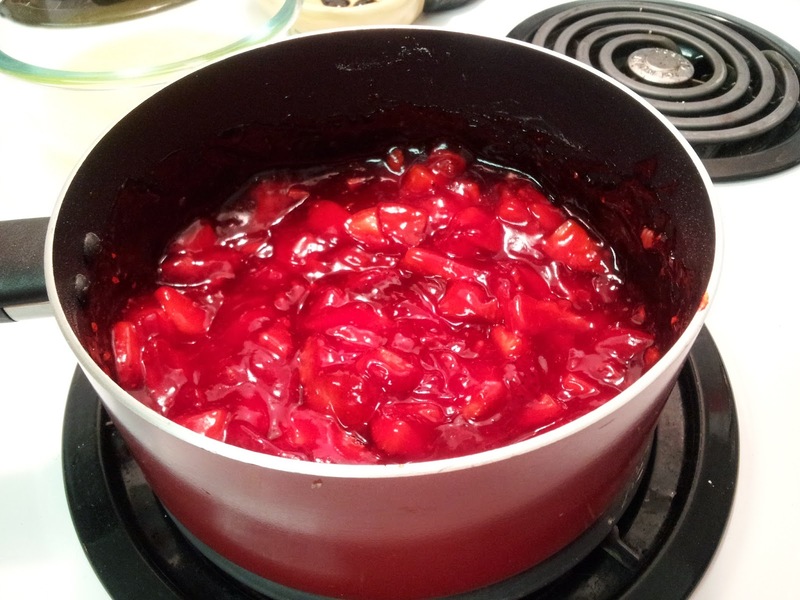 - Pour strawberry mixture on top of the lemon filling. 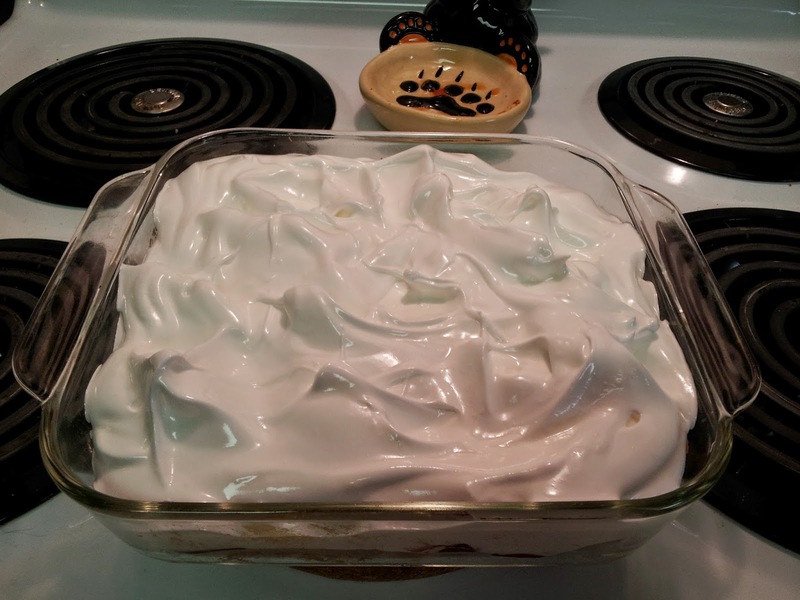 Put pie back in fridge while preparing meringue filling. 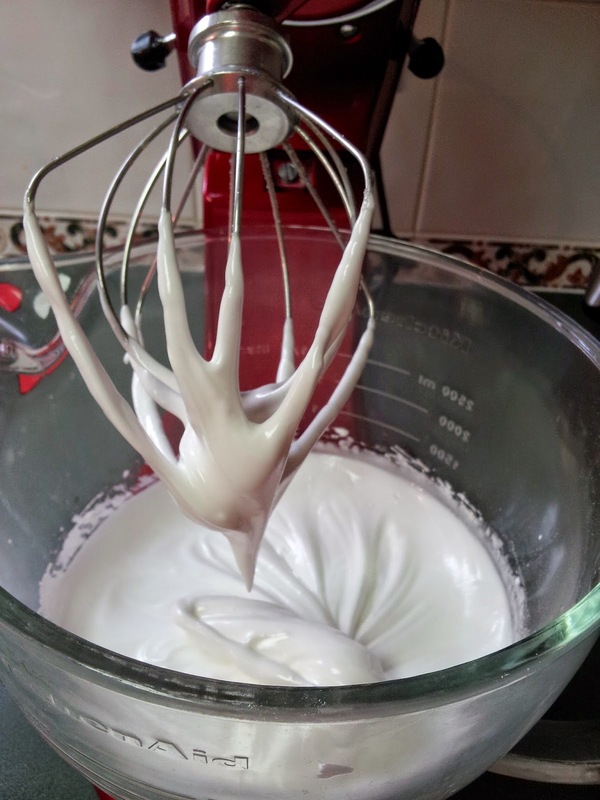 - Place back into oven for 5-8 mins, until meringue is toasted and golden in colour. - Remove from oven.... and dig in!! YUM YUM! 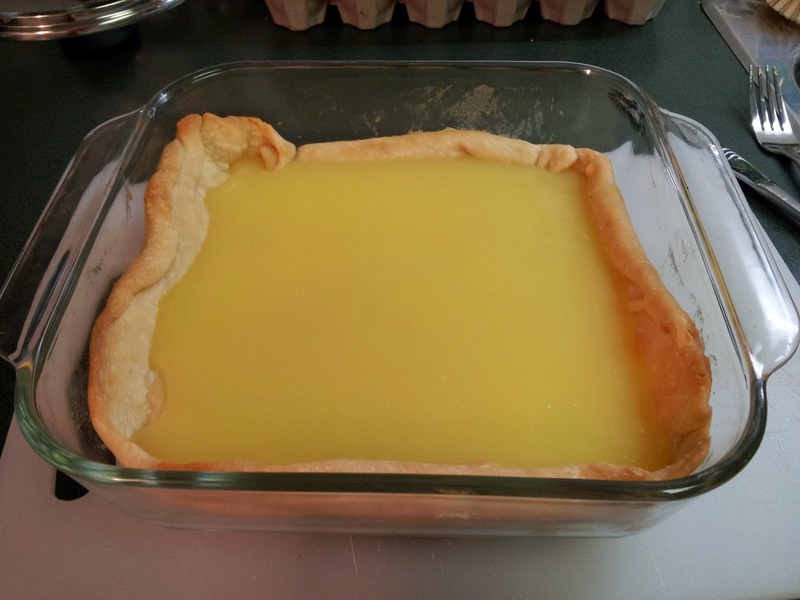 I placed the pie, lightly covered in plastic wrap, in the fridge overnight as I was serving it up at the office the next day.. it holds up perfectly! This is a perfect light and fluffy dessert for those hot summer nights. Which reminds me... Maybe I should think about firing up the BBQ for dinner... hmmm...Maybe a run first... Until next time! CHEERS!